Bedandbreakfast.com will be sending one lucky winner and their guest on a dream vacation to Dublin, Ireland for a fantastic Bed & Breakfast getaway! 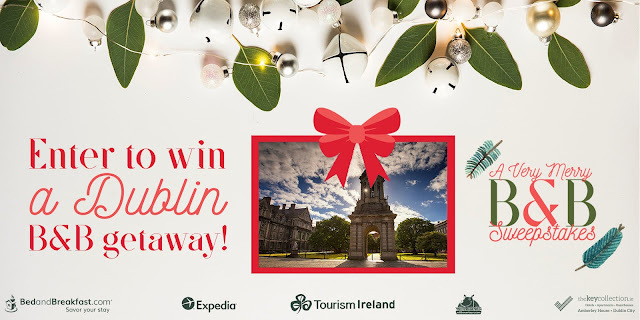 One (1) winner will receive a trip for winner and one (1) guest to Dublin, Ireland by December 31, 2018. The trip consists of: Up to $2,000 to be used to book airfare on Expedia.com. Airfare must be booked directly through the designated contact at BedandBreakfast.com. A five (5) night stay at Amberley House B&B Dublin City, to be booked directly through BedandBreakfast.com, subject to availability and blackout dates. The winner may be required to provide a credit card upon check-in for incidentals. (A $750 value) Up to $500 towards a car rental in Dublin, Ireland. The winner will be required to pay for the car rental up front and submit a receipt to Sponsor for reimbursement. The car rental is subject to the car rental company terms and conditions. The driver will be required to provide proof of a valid driver’s license. A Dublin to Giants Causeway, Belfast City & Carrick A Rede Rope Bridge Day Tour for two (2) persons through Wild Rover Tours, to be booked directly through a designated contact at BedandBreakfast.com. (A $155 value (€130).) The approximate retail value of the prize is $3,405. This Sweepstakes ends on 12/02/17 and you can ENTER ONCE to win.